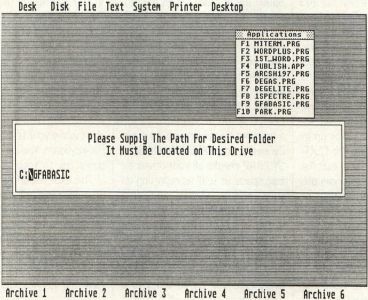 Early in 1988, John Holder asked me to help beta-test a desktop-replacement program he was developing. He was very excited about the project. "It's wonderful!" he said. "You'll never have to use windows again!" Wait a minute! I thought to myself. I like windows! That program was VDOS, and it was eventually released as Shareware. VDOS was distributed at no cost; if you wanted the manual, you had to send in money and register your copy. Many people did send money, and the developers were encouraged to provide the much-improved version that has now been released commercially as VDOS ProQueue. I do like windows, but this program has nevertheless become indispensible to me. VDOS ProQueue is a powerful operating shell program that replaces the GEM desktop, but it also provides many features that are not ordinarily available. The program requires very little memory to run (42K). It can be automatically installed upon boot-up. The authors claim there is near-complete compatibility with all existing ST software; all of the programs I have used with it have functioned normally. ProQueue's desktop offers a series of drop-down menus that are used to perform typical GEM desktop functions such as copying files, as well as a variety of functions one might normally find in a desk accessory. In addition, the ProQueue desktop has an Applications Box on the right side of the screen and six pop-up archive menus along the bottom. There are several advantages to using VDOS ProQueue instead of your ST's desktop, but for harddrive owners, the premier advantage is undoubtedly the ability to instantly execute a program with a click of the mouse (or by pressing a key), no matter how deeply nested in folder upon folder that program may be. Just a bit of initial setup is required to make this possible. With point-and-click simplicity, you tell ProQueue where the program can be found and "define a slot" on one of ProQueue's menus of immediately executable applications (that is, either in the Applications Box or on one of the archive pop-up menus). These defined slots are then saved to disk, and every time VDOS ProQueue is loaded, it automatically knows where your favorite programs can be found. It takes about half a minute per program to define the slots if you go about it leisurely. This procedure needs to be done only once, but if you want to change your definitions at a later time, the process is just as simple. Ten programs can be defined in the Applications Box. 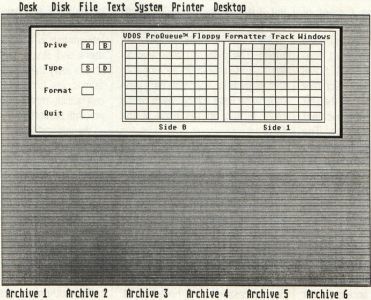 The box is displayed continuously, and these programs can be executed immediately by clicking directly on them with the mouse or by pressing the corresponding key (F1 to F10). The Applications Box is reserved for those programs you use most frequently. Ninety additional program slots are provided in pop-up menus (the archive program slots). Keyboard macros are not available for archive programs. Execution speed is very fast. The drop-down menus contain many options with which UNIX and DOS users may be familiar, but which are new to ST-only folks like myself. For example, on the disk menu are the following options: MVDIR, MKDIR, RMDIR, FORMAT, COPYDIR, CHDIR, VIRTUAL, DSKFREE, CHDRIVE and WHERE?. On the file menu are: DELETE, MOVE, COPY, FDATIME, FIND SIZE? LS -W, LS -L, CHOMD, TOUCH and RENAME. All of the menu items have keyboard macro counterparts. In many cases, these functions are performed more efficiently with ProQueue than is possible with the GEM desktop. The disk and file menu offerings perform a variety of functions, some of which require more complicated sequences if performed on the GEM desktop; others are simply not possible through GEM at all. MOVE, for example, copies a file or group of files to another directory and deletes the original file(s) all in one action. Likewise, MVDIR will move a folder and its contents to another drive and directory and delete the original folder. COPY lets you copy a single file, or a group of files with the same extension, or a group of files all beginning with the same letter, etc. FIND will find a file you are looking for, as long as you can remember the file's name and the drive it's on. The FORMAT option provides only the regulation single-and double-sided formats, but it displays a graphic report on the formatting process that is very helpful in diagnosing and isolating disk formatting problems. A TOUCH option allows you to update the date of a file, which proves handy for programmers. CHMOD will hide files from the GEM desktop, but VDOS ProQueue will recognize them. To list all the files and folders in a directory, even hidden files, you can click LS -L (for a single-column listing with very complete information) or LS -W (for a brief three-column listing). The DSKFREE option reveals the free space remaining on a drive much faster than the Show Info option on the GEM desktop. Some of these file/directory-manipulation functions are performed using the familiar GEM file-selector box. For example, if you click on DELETE, a file-selector box displays the current path, and you simply select a file and click OK. In these cases, if the current path is not the one you need, you can alter the path as you would with a file-selector box in any program. However, other functions, like COPYDIR, for example, require you to type the name of a file or folder in a dialog box. The box will display the current path when it appears. You cannot change the drive path with the dialog box, so before you select COPYDIR, you need to make sure you are on the proper path for the folder you want to copy. Until I became accustomed to it, the dialog box system was a problem to me. VDOS ProQueue makes it so easy to execute programs without regard to their directories or subdirectories that I found myself forgetting which directory or subdirectory they were in! Fortunately, the FIND option was available to refresh my memory. The text and printer menus offer a variety of options related to text files and your particular printer setup. On the GEM desktop, you can double-click on a text file and select Show, Print or Cancel from an alert box. VDOS ProQueue's DISPLAY option corresponds to Show, although it has some differences. If a line of text is over 80 columns long, ProQueue will divide it over two lines, for example. Like Show, DISPLAY will allow you to read farther into a file, but not back up to the beginning. However, the TEXT-WIND option displays your text file within a GEM window; you can use a scroll bar to move forward or backward as you examine the file. SEARCH will look for a text string in your chosen file. Another clever option is MERGE, which allows you to merge two text files into a single new file. LC will count the number of lines in a file. I think I would have found this more useful if it counted the number of words. Sometimes I want to see only the beginning or end of a file to jog my memory as to its contents. Clicking HEADS or TAILS will call up the first few or last few lines almost instantly. I find the text menu to be a great improvement over the standard desktop. 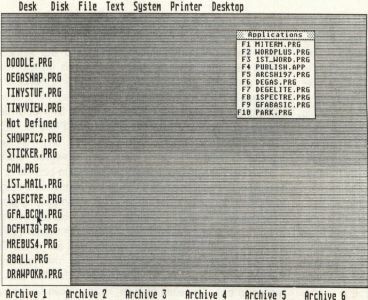 The printer menu offers the counterpart to Print on the GEM desktop, but it also allows you to check to see if the printer is on, select pin-fed or sheet-paper options, send an escape sequence to your printer and output a text file to the screen and the printer simultaneously. The system menu has a long list of options; many of these may currently take up a desk accessory slot on your GEM desktop. For example, ProQueue offers a built-in multiyear calendar, a screen saver to darken the screen when you leave your computer temporarily, a date/time display, an option to invert the colors on a monochrome monitor, a password system, an option to display free memory remaining and an auditor. The AUDIT option is a real boon to programmers and business users who must account to the IRS or their bosses for their computer times. It keeps a constant tab on every application you run and when you begin and end your work with that program, and saves the information to disk. The audit file can then be printed. I chose the AUDIT option the first day I used the program and didn't give it much thought for some time after that. Six days later—after my computer had been turned on and off many times—the auditor was still keeping track of my program usage. This menu also provides the EXECUTE option. If you want to run a program for which you have not defined a slot, EXECUTE will do it. SYSMAP checks all your drives for free space, as well as reporting on your printer status and free memory. $HOME returns you to the initial directory (wherever VDOSPRO.PRG is located). VERIFY lets you turn off (or on) the GEMDOS system that performs a check every time you try to write to a disk. Turning VERIFY off can save a great deal of time on file copying. It would seem more appropriate to me to have placed both VERIFY and $HOME in the disk menu. The system menu also allows you to reboot your computer; this is great for Mega owners who otherwise have a long reach to the reset button on the back of the CPU. Yet another option in the system menu is ACCESSORY. Desk accessories are not immediately available from the VDOS ProQueue desktop. When you click ACCESSORY, the desktop is replaced by a single desk menu. The top option in that menu will return you to the ProQueue desktop; the slots below it are filled with whatever desk accessories you have booted. This is not the nuisance that it may seem. Transition between the desktop and the ACCESSORY menu screen is instantaneous. The final menu, desktop, allows you to exit the program and return to your ST's GEM desktop. VDOSPRO.PRG functions only in medium and high resolution. You can, however, enjoy the auto-execution benefits of ProQueue in low resolution through the use of an accompanying program, VDOS-LOW. You cannot change resolutions from within ProQueue, so you have to exit to the GEM desktop, change the resolution and run VDOSLOW.PRG. Slots for ten applications can be defined. The various utilities that are offered in VDOSPRO.PRG are not available in low resolution so the only advantage to running VDOSLOW over using the GEM desktop is in the auto-execution of defined programs. ProQueue's manual comes in an attractive three-ring binder. This is an excellent choice of bindings for a book that will need to remain open while your hands are busy at the keyboard. You can order an optional box to keep the binder in. The explanation of the program is well-organized and, generally, clearly presented. The largest chapter lists each of the options in the menus alphabetically with accompanying explanations and examples. Some of the language is very technical; the authors often seek to explain reasons why the program functions the way it does or why certain decisions were made in the development process. This "extra" information is helpful to programmers, and, if you don't understand it, it is easy to ignore. The presentations are arranged so that you can quickly zero in on the most significant paragraphs. Various options for the installation of the program, including installation in RAM, are explored in detail. The authors provide a bibliography, a glossary of terms (a great aid) and listings of error codes and ASCII codes. I would like to have seen an index. Even though the menu options are arranged alphabetically, this would still have been a help. The authors promise continuing support. One improvement I'd like to see is the expansion of the Applications Box to 20 program slots, with the shift key combined with the F1 through F10 keys as macros for the ten additional programs. The archive slots do provide for 90 programs, which is plenty, but no keyboard counterparts are available for them, and the continuous visibility of the Applications Box on the ProQueue desktop makes for more instantaneous program execution. I would also prefer it if a file-selector box were used for those directory and file manipulations in which a dialog box is currently presented. The authors recommend the program for 520ST owners with two drives, 1040ST owners with one drive and anyone with a hard drive. I have found the auto-execution feature to be of benefit primarily when using a hard disk, but the menu option features could well benefit anyone. There are certain features I have grown quite fond of. I wouldn't want to be without my auditor or the text-reading options or the MOVE option, for example. On the other hand, those options are only available in medium or high resolution, so I would hesitate to recommend the program for use without a hard drive if the programs used most frequently are in low resolution. For hard-drive owners, however, and for others who use their machines primarily in high or medium resolution, VDOS ProQueue represents a major improvement over the ST's GEM desktop. D.A. 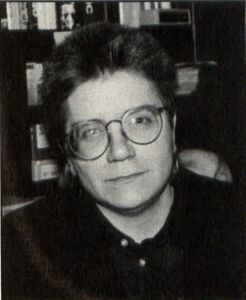 Brumleve is an ST programmer and writer living in Urbana, Illinois.